There are many websites that you can research the financial aid practices of individual schools. Today I’m going to focus on an especially helpful site — the federal College Navigator. The College Navigator is not flashy, but it contains incredible tools that tap into the US Department of Education’s vast college database. Today I’m focusing on just one category — the net price. 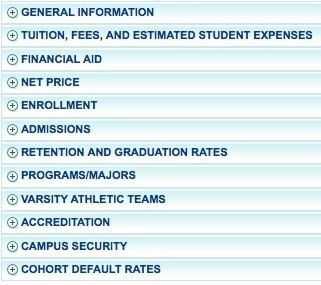 When considering whether a school will be affordable, I like to look at its net price statistics. This is where you can find out what families of various incomes typically pay for one year of college at a particular school. The net price feature takes into account the typical grants and other assistance that students at a particular school obtain. The net price is far more important a figure than the sticker price, which is usually meaningless. To illustrate how the net price feature works on College Navigator, I’m using Penn State, which has been in the news lately for all the wrong reasons, and Gettysburg College, a private liberal arts college that’s also in Pennsylvania. The latest net prices are from 209-2010. During that year, the sticker prices for Gettysburg College was $49,500 and at Penn State it was $29,520. Looking at the net price of schools via the College Navigator is a great way to dispel misconceptions about the costs of individual institutions. For accepted low-income applicants, for instance, Gettysburg is cheaper. Gettysburg is one of the rare schools that can meet 100% of each of its student’s demonstrated financial need though it does include loans in its packages. When I checked over at the College Board, the average loan was $5,183, which would be covered by a Stafford Loan. Public institutions like Penn State just don’t have the financial resources to be as generous to low-income students. Which Colleges Claim to Meet Students’ Full Financial Need? On the other hand, Penn State will be a slightly less expensive alternative for wealthy students. Of course, price is hardly the only factor when choosing schools, but it’s good to obtain an idea in advance of looming costs. You’ll find plenty of more great statistics on the College Navigator and I’d urge you to explore the site.